I often complain on this blog about how construction sites seem to collect trash. Over the past year, I’ve photographed lots of garbage on construction sites. 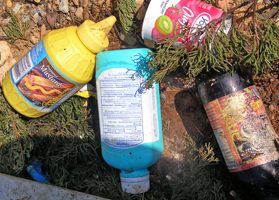 This abandoned (or slow to be developed) site for Travis Trace has a complete set of condiments, along with Mylanta and Yoplait Yogurt, which are good for an upset stomach. 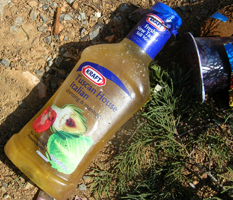 From sight, I could see that the Kraft’s Tuscan House Italian Dressing was unopened. Why didn’t the freegans find this site? We have neighbors who are relocating to Denver. I quickly snapped this shot of their trash (yes, it was out for the garbage pick up) this morning as I left for work. This is not stuff which was loaded on the truck. 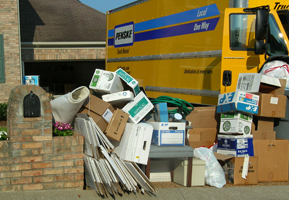 I was shocked last night when I saw all the empty boxes lined up for the trash collector. Also included: a chair and a garden hose. I hope that the men who pick up the trash were able to salvage the chair, which looked fine; maybe just needed some reupholstering. The garbage can is on the far right mostly hidden by boxes. Instead of moving out, this couple looks as if they just moved in. Tonight the truck was still in the same place, but the “trash” was gone. I wish I had called 1-800-FREEGAN. Unlike the Freegans, we’ve never dived in dumpsters. We’ve scavenged from our neighbor’s trash. A former neighbor was putting two cat carriers out for the trash collectors, when I asked if I could have them. Since someone dumped the two cats who adopted us, I had no problem accepting something free that would help with their care. While walking one morning, I found a “sick” nandina perched on a broken chair out for trash pick up. Ignoring the chair, I grabbed the nandina and planted it in my front yard by the mailbox. It has done well and survived the drought of summer ’07. While walking, running or cycling, we’ve found lots of stuff: dog toys, baseball caps, screw drivers, small toys, car flags, a tiger puppet and a Rolling Stones CD. We have found lots of other things as clothing, but I never wanted to bring clothes home, although I have seen new-looking men’s dress shirts. The best item we ever found we didn’t bring home. We saw a cedar chest out by a dumpster. We had no way to take it home. Later we got in the car, drove over to where it was. Someone else had captured the treasure. We read about Freegans in Newsweek. Now The Tennessean in Nashville has found freegans living here. After watching this video and seeing one of the freegans lift out a bag of limes, we may have to dumpster dive ourselves (not). We like what these guys are doing. There is too much food wasted in the U.S.